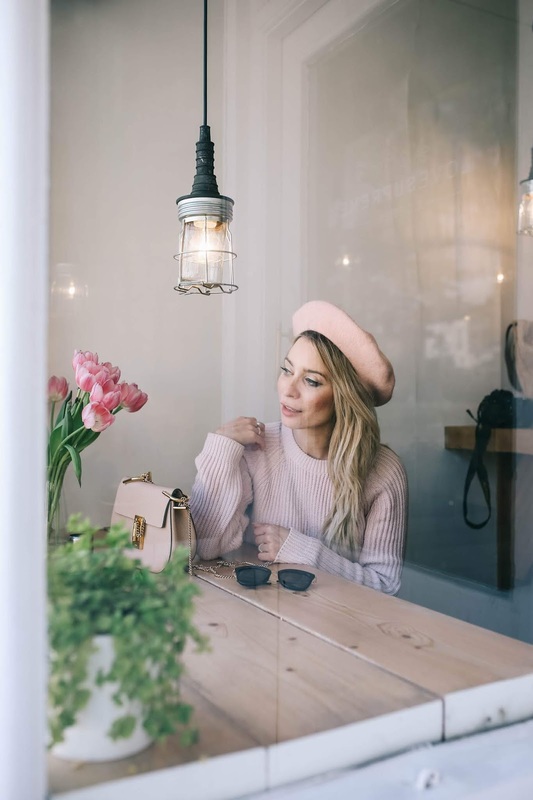 Seven Nights in Ireland with Air Transat | La Petite Noob | A Toronto-Based Fashion and Lifestyle Blog. 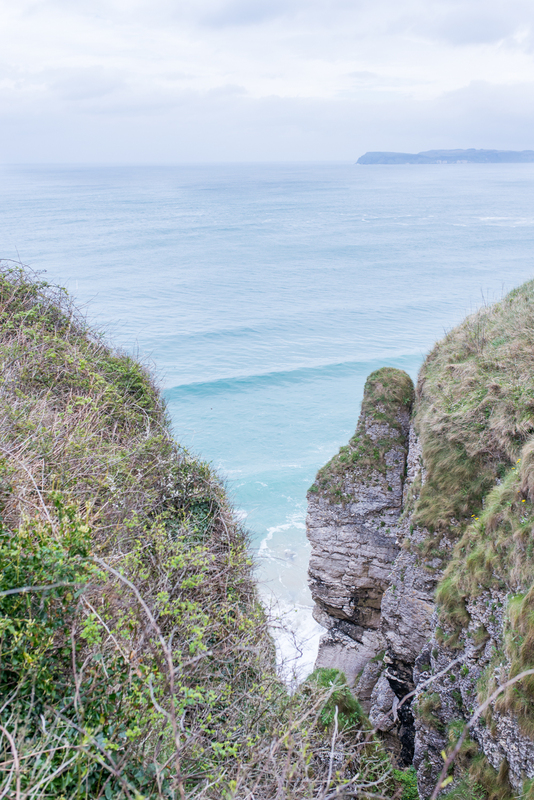 A few weeks ago, I had the absolute pleasure to embark on an incredible adventure through Ireland with Air Transat. I had never been to Ireland before, but had always wanted to visit. 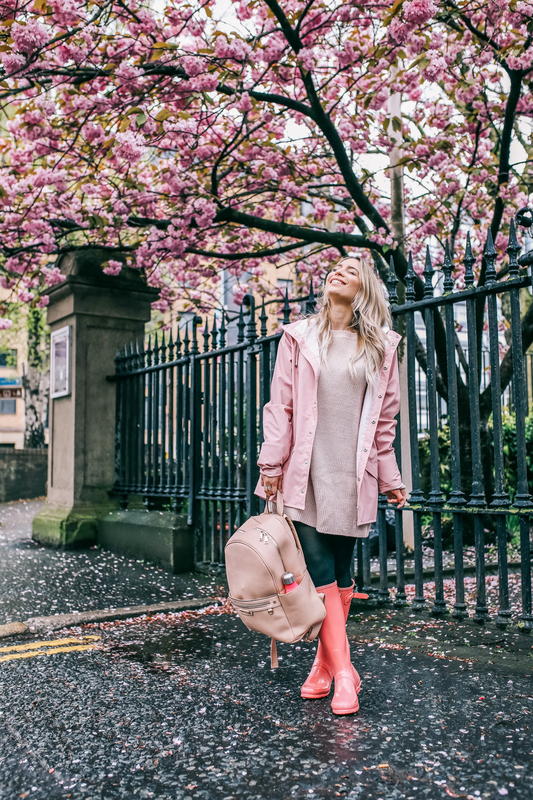 When the opportunity came up to explore what the country had to offer with one of my favourite airlines, Air Transat, you know I didn't even have to think twice before responding with an enthusiastic yes! Seeing as though I don't have any family ties to Ireland, either through my own family or that of Brian, I honestly didn't start my trip with a whole lot of knowledge on the country. 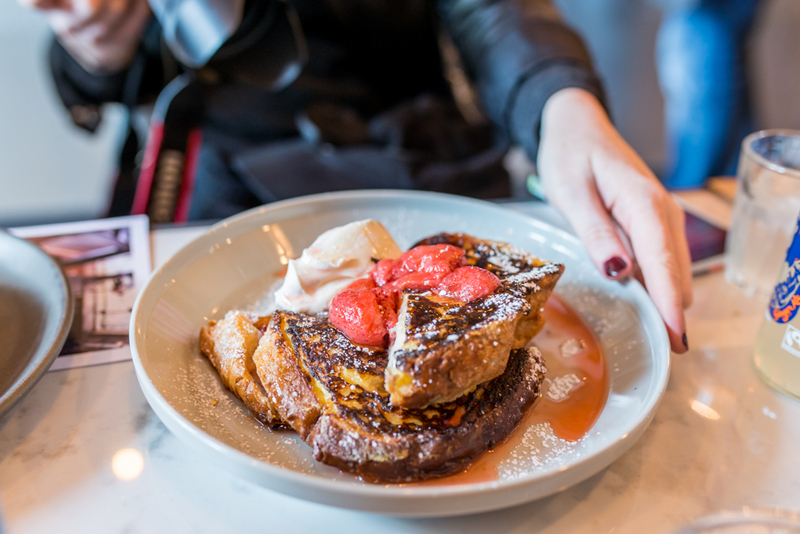 It's situations like these where I'm grateful for Air Transat's travel offerings; not only do they provide direct flights from major Canadian airports, but they have itineraries available that include hotel accommodations, travel arrangements between landmarks and even meals. 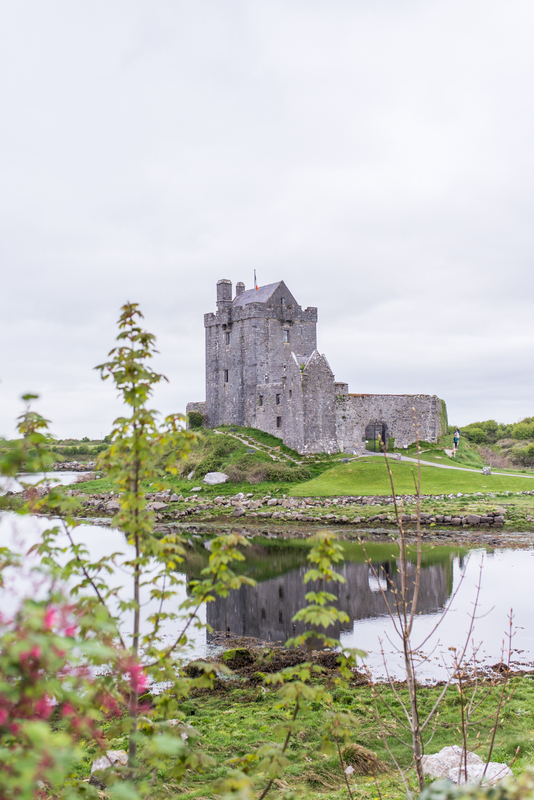 For someone who wanted to see as much of a new country as I possibly could, I was so excited to be able to take advantage of a pre-planned itinerary to see what adventures Ireland had to offer - and what an adventure it was. I feel as though I left a piece of my heart in Ireland and remain humbled by the beauty, grace and culture that the country has to offer. 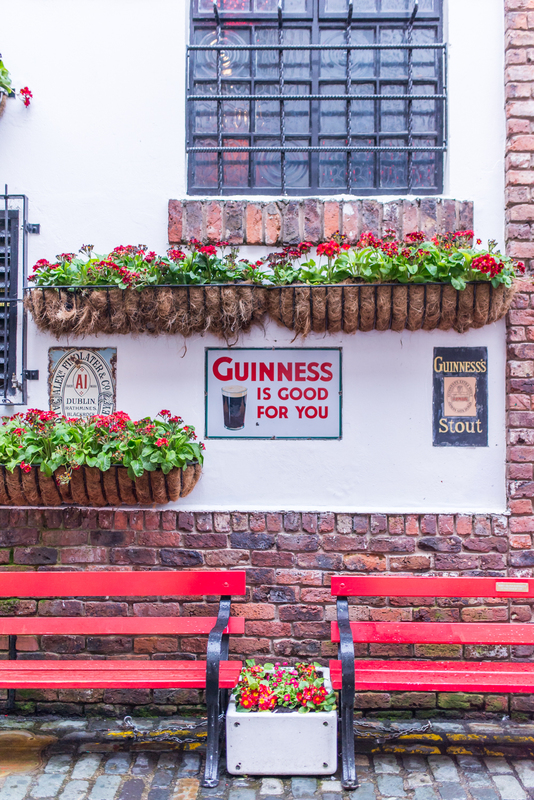 Here's a peek into our Irish adventure, our seven-day itinerary and some notable memories along the way. Express Check-in. You guys - I absolutely hate lines. The fact that Air Transat Club Class passengers have their own express line for checking in, and luggage drop-off is incredible. Priority Boarding, which might be my favourite perk of flying Club Class. I absolutely love how you're able to bypass the commotion of boarding the plane by being one of the first to be boarded and seated. It makes sure that I'm seated comfortably on the plane in no time, with a sparkling bevy in-hand, of course. That brings me to my next favourite perk of flying Club Class; the assortment of food and drinks! You guys know me well enough by now to know how important a well-stocked bar and delicious eats are to my happiness. 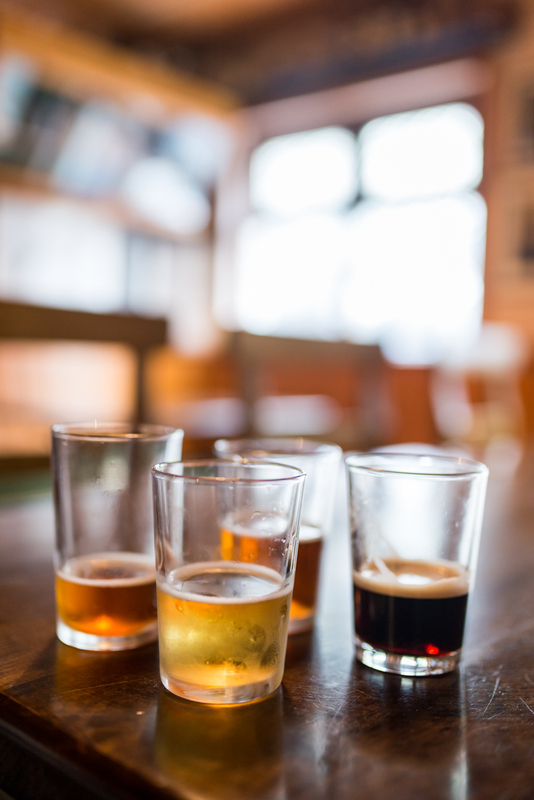 Thankfully for me, Club Class offers both with in-flight wine, beer and spirits (including my personal favourite, Bailey's on the rocks) and a menu created by chef Daniel Vézina. For this particular trip I enjoyed the square crepes with goat cheese and smoked salmon for breakfast on the flight from Toronto to Dublin, and the pulled beef shepherd’s pie on our return flight home. Delicious. The level of comfort when flying Club Class with Air Transat is a treat, and really helps to set the tone for your trip. Spacious seats, friendly in-flight service and my favourite: a comfort kit that includes a sleeping mask, inflatable neck pillow, ear plugs and much more. I used everything in the comfort kit during our red-eye flight from Toronto to Dublin and actually managed to sleep for a few hours - a luxury I am rarely able to achieve on airplanes! I always treasure the times that I'm able to fly Club Class with Air Transat, and recommend the experience for anyone who has anxieties related to air travel, is taking a celebratory trip and wants to make the experience memorable from start to finish, or just wants a little luxury in their lives. Our whole group arrived in Dublin refreshed, well-slept and excited to explore Ireland. We arrived in Dublin bright and early and were all feeling well-rested and excited for the week to come. 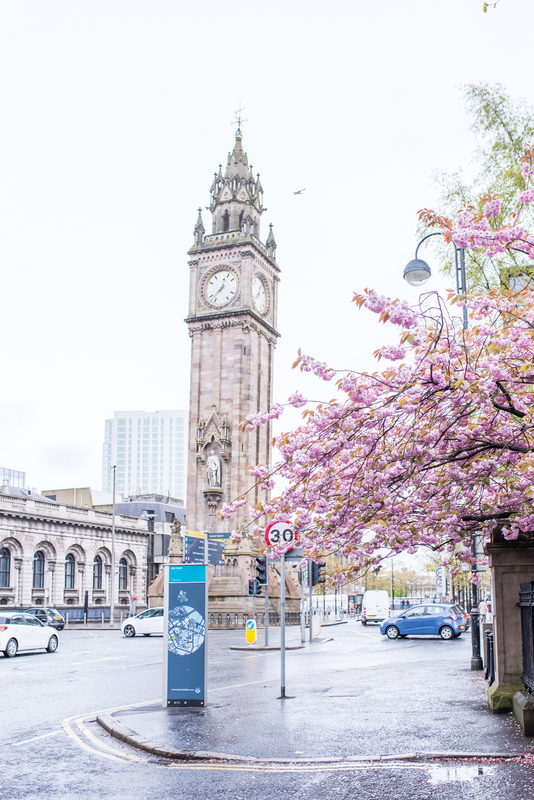 After picking up our luggage (a breeze since flying Club Class with Air Transat gives your luggage priority and ensures it's one of the first to arrive on the carrousel) we hopped into our coach and were on our way to Belfast in Northern Ireland. While I had anticipated taking a nap on the drive from Dublin to Belfast, I was so taken by the beauty of Ireland that I stayed awake and just stared out the window the entire two hour drive. You guys, they call Ireland the Emerald Isle for a reason - it's absolutely beautiful! We had an incredible walking tour of the Belfast city centre from our hilarious and knowledgable guide Dee Morgan. 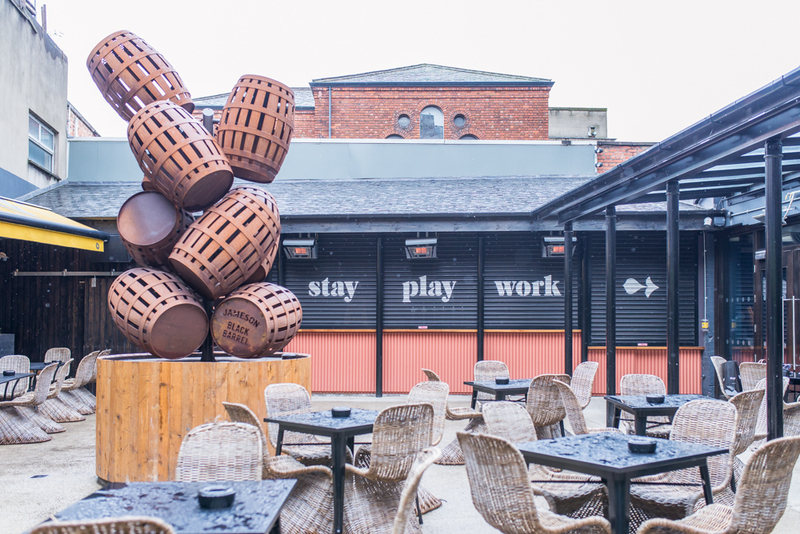 Belfast is Northern Ireland's capital, but still feels so walkable and friendly. It seemed like everyone knows everyone else, and you rarely caught anyone without a smile on their face. 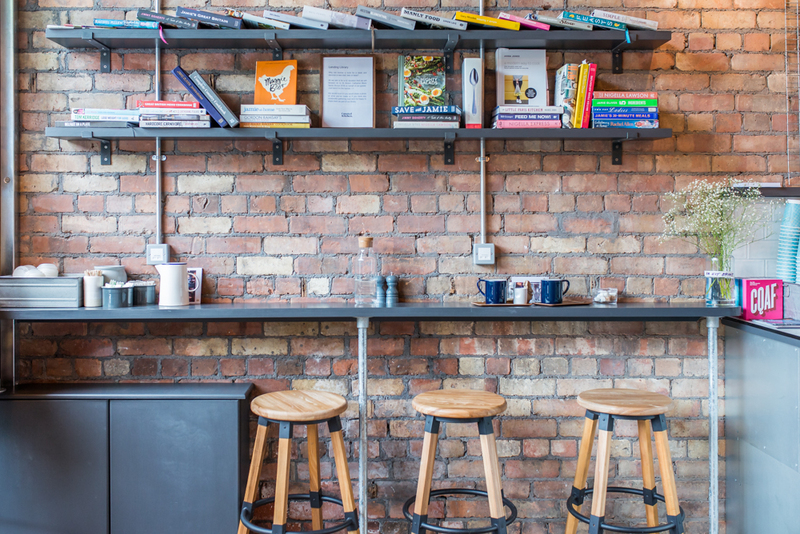 We stopped for lunch at Curated Kitchen, a beautiful little eatery in the heart of Belfast that has a changing menu of dishes found from their open library of cookbooks. The food was delicious, and I was so moved by the owner's commitment to building a community through his dishes. I would highly recommend paying a visit should you find yourself in Belfast. 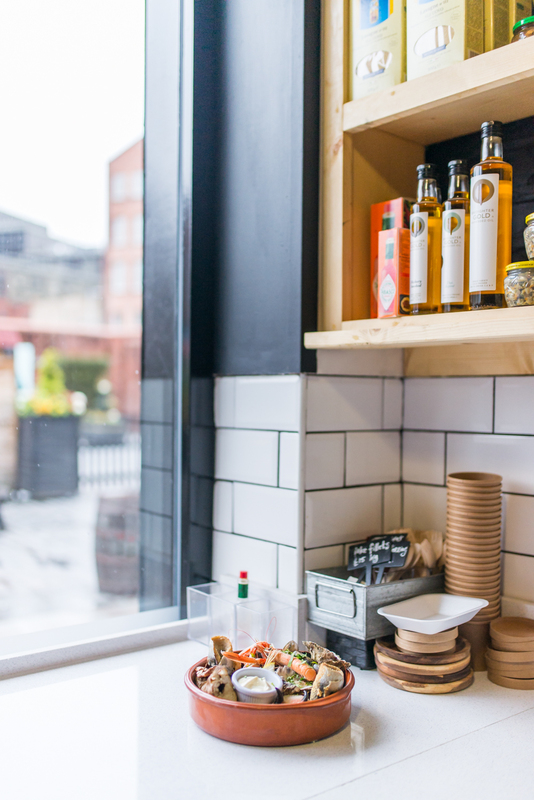 At night, we had the pleasure of taking part in the Belfast Bites Tour; an intimate walking tour of all of the best places to eat in Belfast. 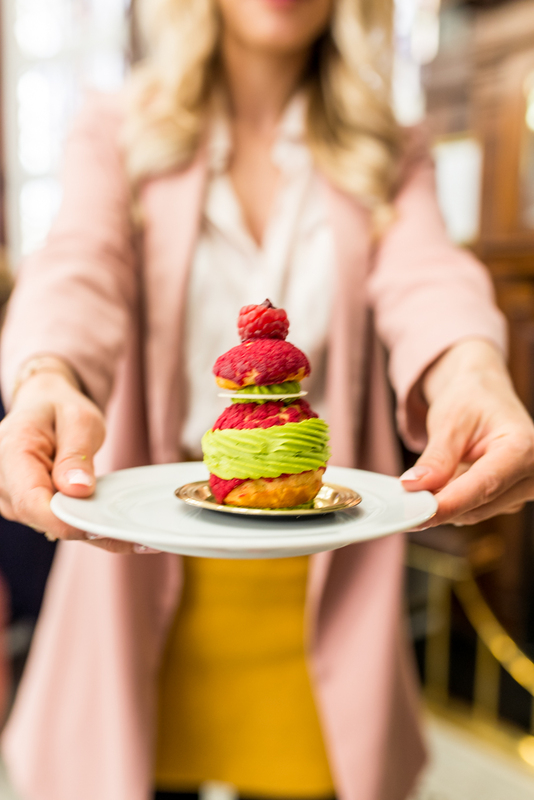 This tour was a real treat for our group of foodies, and I really felt as though it was the perfect way to orient ourselves to Belfast and get a real taste of the emerging food scene. My favourite stop from the entire tour was Muriel's Café Bar, where we sampled delicious gin cocktails. This tour was one of the highlights of the trip for me. After a long and incredible first day in Northern Ireland, we all crashed at the Bullit Hotel. This hotel is modern, has incredible energy and is very centrally located in the heart of Belfast. One feature of this hotel that I absolutely loved is that they provide you with a brown bag to hang on your door before you go to sleep and when you wake up in the morning it's filled with a delicious breakfast. Between the brown bags and the on-site café, it was always a good morning for me. After spending a relaxing morning in bed with my brown-bag breakfast from Bullit Hotel, I quickly got ready to meet the group in the lobby and begin our day. 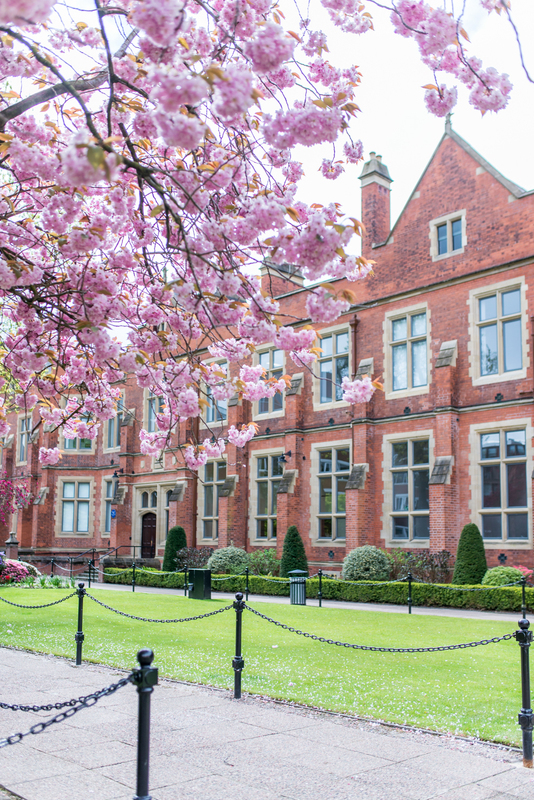 I felt as though I had learned so much about Belfast from the day prior and was eager to dive into the history of Northern Ireland. We visited the Ulster Museum, which taught me a lot about the history of the conflict in Northern Ireland. We were also lucky enough to see the Game of Thrones tapestry exhibit that was on display. I am a huge Game of Thrones fan, so this was definitely a highlight for me. 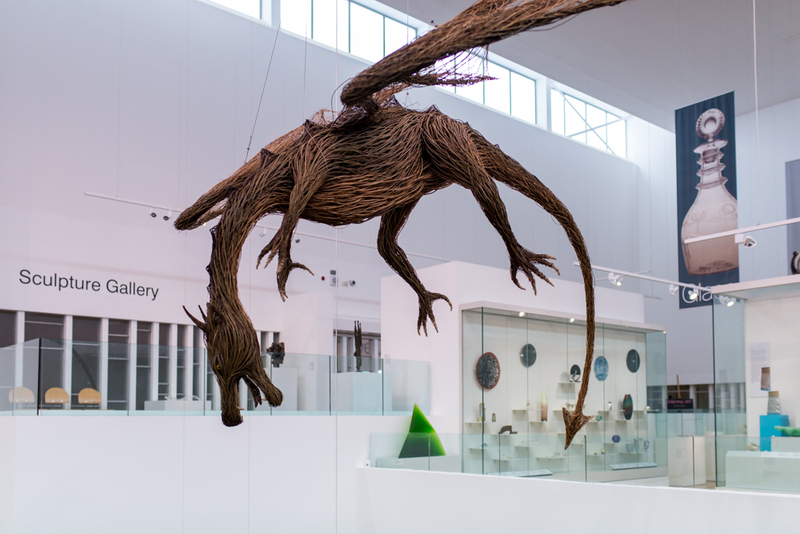 The Ulster Museum is located in the Botanic Gardens, which is absolutely stunning to see. Next was Titanic Belfast, which was a treat for me. As most girls who came of age in the 90s, the Titanic movie was my religion. 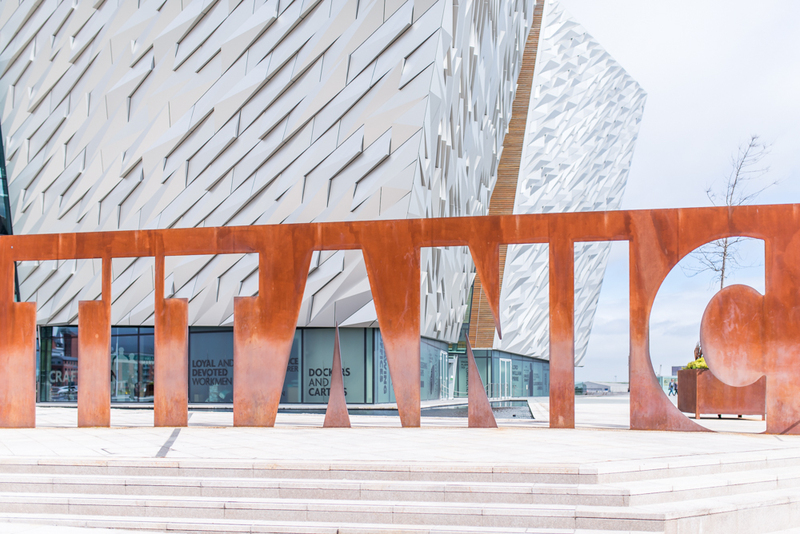 The museum was a definite highlight; it did an incredible job to giving you a very in-depth look at the story of Titanic. I also really found the recreations of the accommodations on the boat itself, from first class all the way to third class so interesting. Such a well-done museum, I would go again in a heartbeat. The restaurant is also a treat; visually it's gorgeous and the food is incredible. 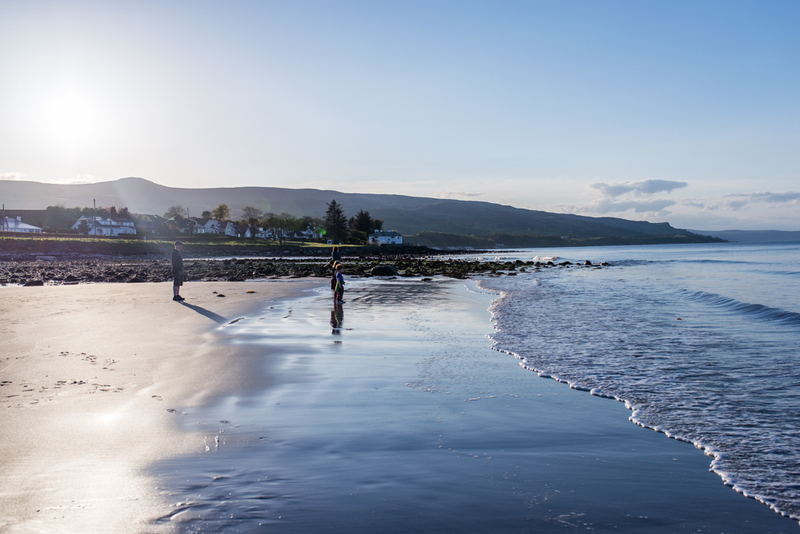 All around, an amazing way to spend an afternoon in Northern Ireland! Later that afternoon we had a super-informative Street Art Walking Tour. 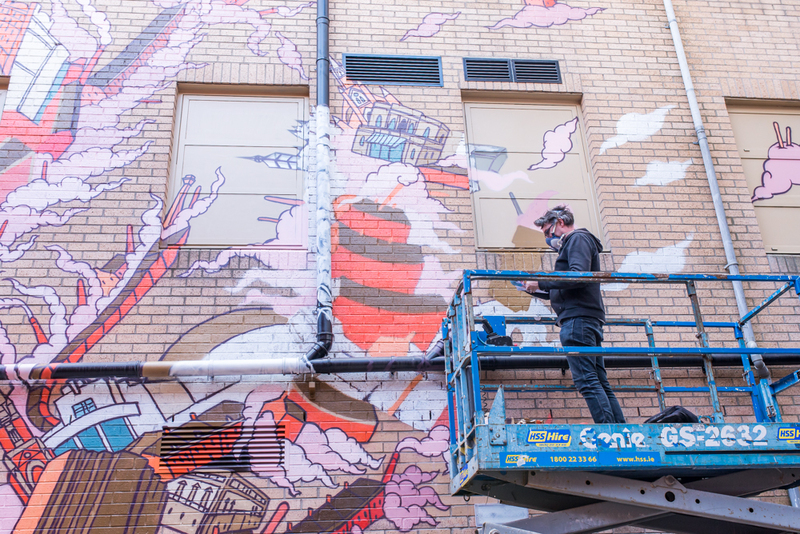 I had no idea that Belfast was so renowned for its street art, and is actually a destination for many artists to display their talents. We learned that the street art scene in Belfast is a community made up and lead by local artists, who are conscious to include women and works that have social and political messaging to them. As an amateur to the street art world, I left the tour feeling completely educated, not only to the art itself but also to the social and political issues going on in Northern Ireland, both past and present. 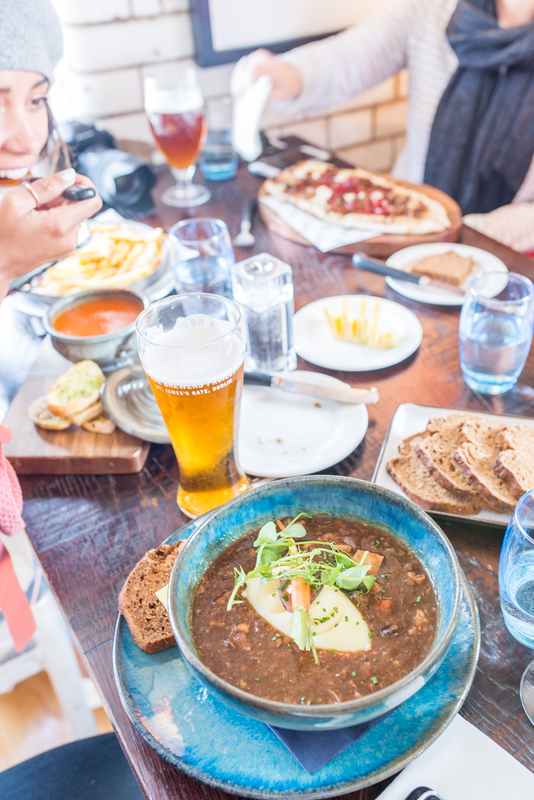 For dinner, we all enjoyed a meal at Babel, the rooftop restaurant at Bullitt Hotel. The view from the rooftop is incredible and the food even better. It was the perfect way to end our last evening in Belfast. 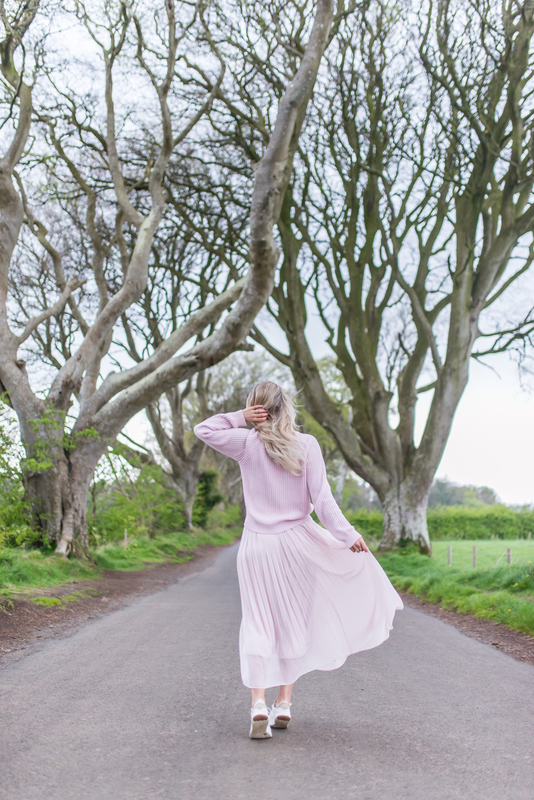 As much as I enjoyed exploring Belfast, I was extremely excited to hit the road and experience the countryside of Northern Ireland. After my last bagged breakfast from the Bullitt Hotel, we checked out, hopped on to the coach and were off to explore! Before we left Belfast for the countryside, we made a stop at the St. George's Market, the only Victorian covered market in Belfast. This market is the perfect place to pick up a morning coffee, pastries, fresh produce and local crafts. I myself got a delicious, strong coffee and sampled some local pastries. 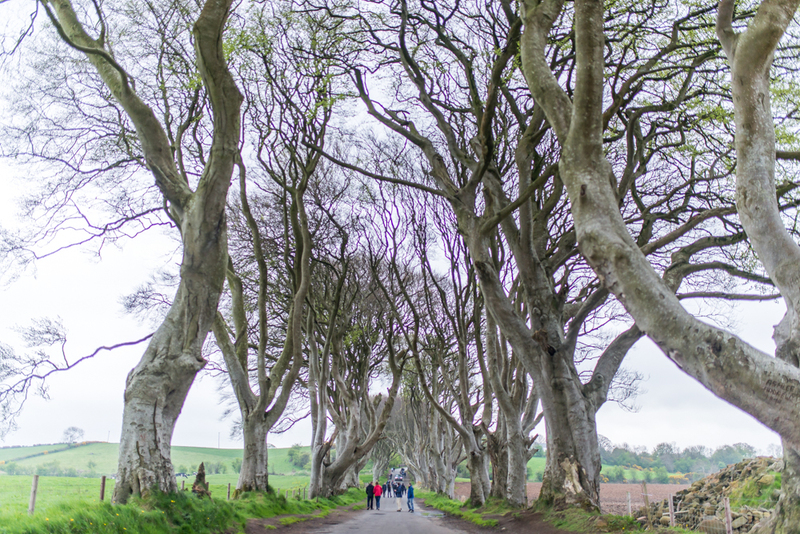 We then made our way through Northern Ireland's countryside to visit the famous Dark Hedges, the most photographed spot in the area. You guys, if you're a Game of Thrones fan like I am then this is an absolute must. Towering, twisting tree branches line the road and, while you're not able to drive down it, it makes for an impressive walk. 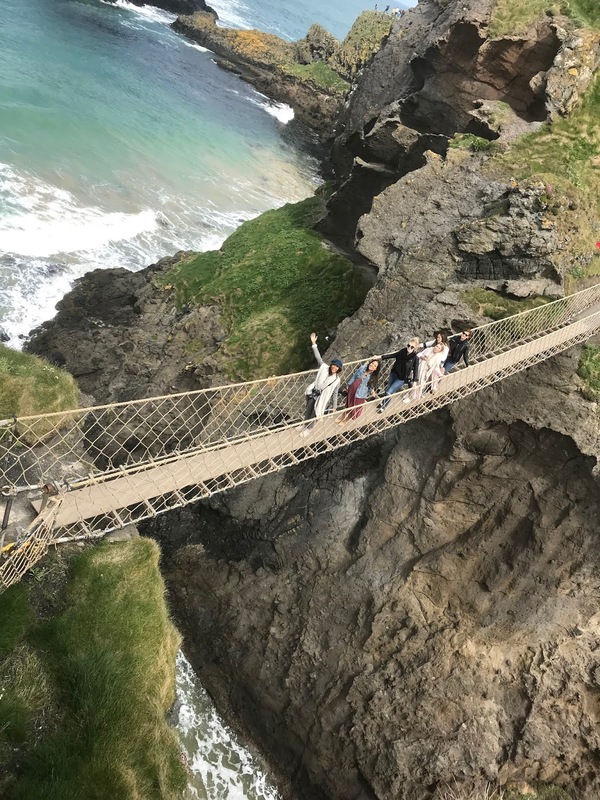 We then made our way to the coast to visit Carrick-a-Rede Rope Bridge, Northern Ireland's famous bridge that joins the mainland to the island of Carrick-a-Rede. The whole scene is incredible beautiful, with colours so vibrant that I swear it wasn't real. The rope bridge itself is quite the experience - it's very slim and sits 30 meters above the rocks and as you cross you hear the sea crashing against them below. Definitely not for the faint of heart - don't look down! My adrenaline was pumping all day from the experience! After grabbing a quick lunch at The French Rooms, we were back on the coast and off to visit Giant's Causeway. 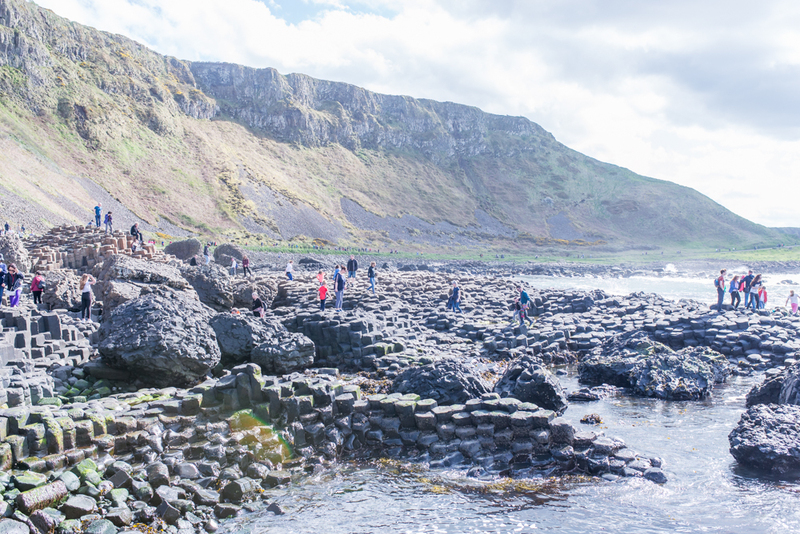 Giant's Causeway is another one of those need-to-see-in-person natural phenomenons - over 40,000 interlocking columns on the water that line the shore. This breathtaking sight is the result of an ancient volcanic eruption, although if you believe the Irish mythology it was built by a giant. By the time we arrived the sun had begun to gently set, and our entire group just found a seat on one of the many columns and quietly took in the serenity of the whole scene - it really was beautiful. This stop and this moment was easily one of my favourites of the trip. We then made our way to Ballygally Castle, where we would be staying for the night. A beautiful 19th century castle, legend has it that it's been haunted for over 400 years by the ghost of Lady Isabella, a former resident. While the hotel has since been renovated beautifully, they have honoured their famous ghost by keeping her room in the tower completely intact and labelling it the 'ghost room.' Guess who's room was in that same tower? Me. While the folklore and my own superstitions definitely made for a spooky night, I'm happy to report that I didn't have the pleasure of meeting Lady Isabella that evening. Maybe next time, haha! With a night in a beautiful, haunted castle under my belt it was time for our group to leave Northern Ireland and make our way to Ireland. We made our way from the castle, back to Belfast and then on-route to Dublin. Once we arrived in Dublin, we met our tour operator Darren from Vagabond Tours who would be showing us through Ireland. We then made our way on-coach to Galway. Once we arrived in Galway, we checked into The House Hotel. 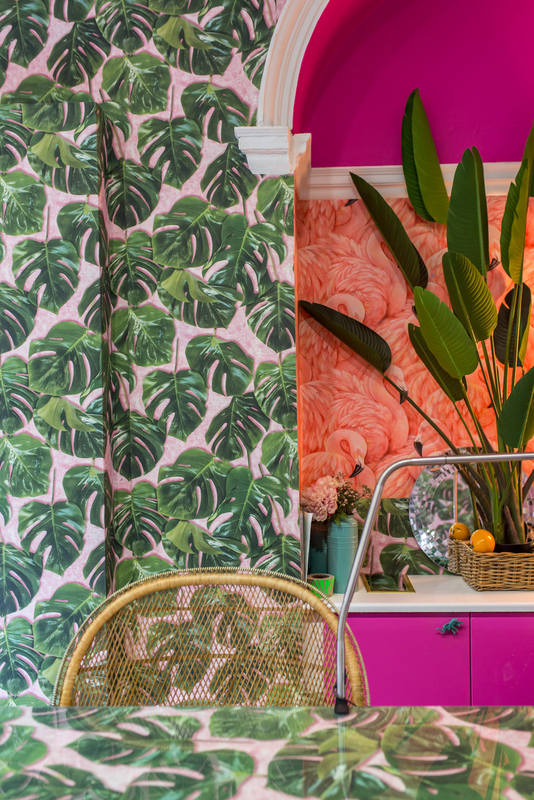 You guys know me well enough to know that my favourite colour is pink, so the decor at The House Hotel was completely up my alley - so much pink! Our group enjoyed dinner at Ard Bia at Nimmos, a restaurant that served traditional Irish fare with influences from around the world. The meal was incredible; easily one of my favourites from the trip. 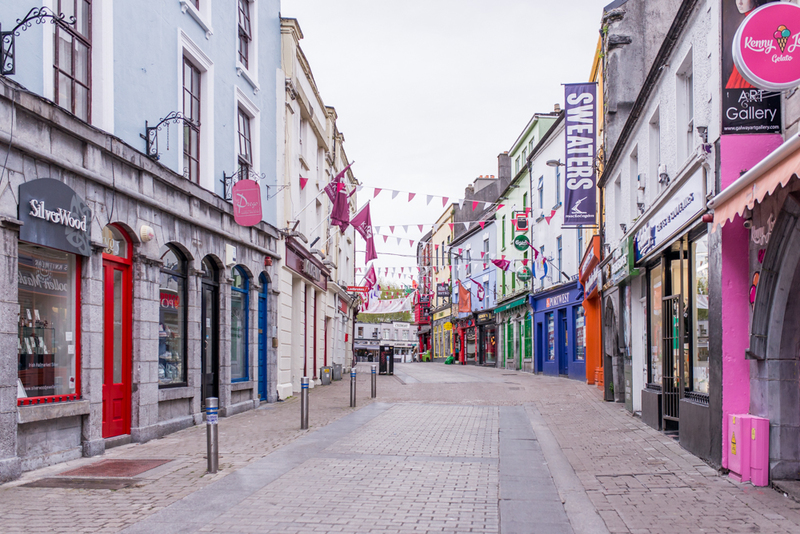 Galway is known for its electric nightlife so that evening we hit the town to see what all of the hype was about. You guys - the hype is real! The party literally never stops in Galway, and it was so nice to be around large groups of people everywhere who were genuinely enjoying each other's company. Needless to say, I had a blast. After a very late night, we got up bright and early to have a quick breakfast, check out of our hotel, and hop into our coach and explore the countryside. 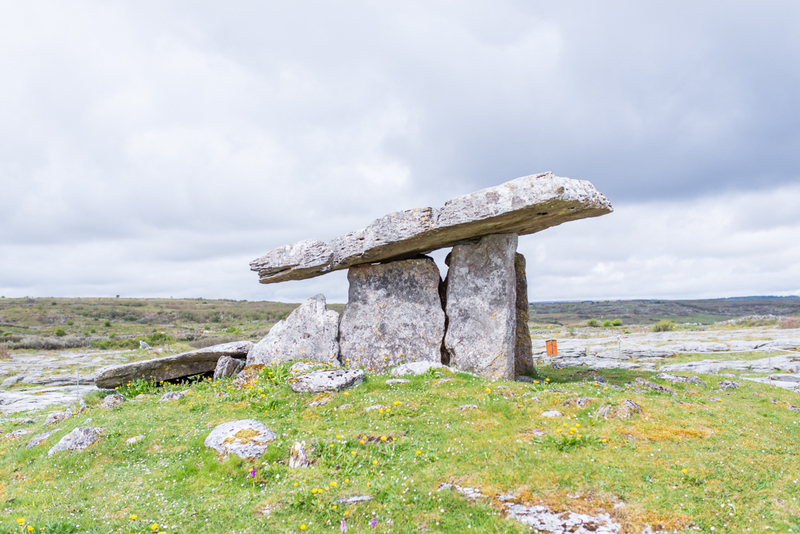 Our first stop was The Burren, a region in County Clare that boasts ancient castles, a landscape of limestone bedrock, fossils, caves - all of that good stuff! I kept on thinking about my dad, who loves geology and would absolutely love this area! 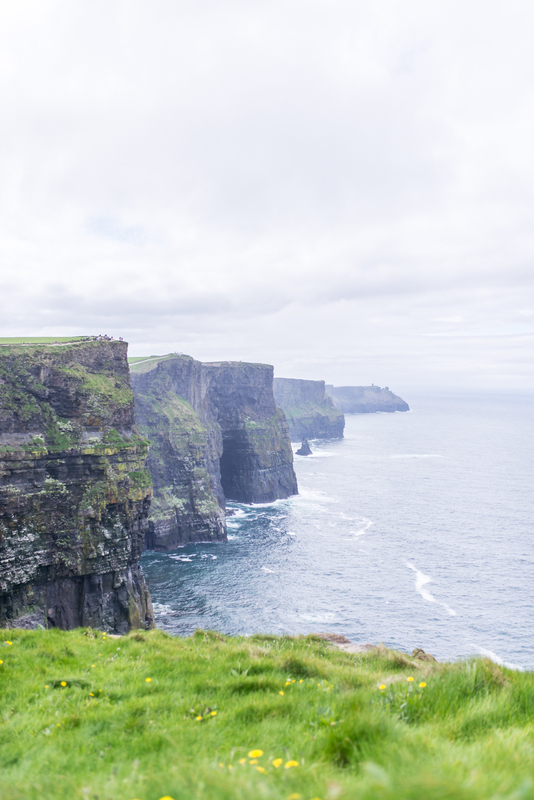 Our next stop was the one sight that I had been looking forward to the most: the Cliffs of Moher. Stunning sea cliffs that span 14 km and have been featured in so many movies - including my favourite, The Princess Bride! I don't know if I could ever find the words to truly describe how beautiful the Cliffs of Moher are - I felt truly humbled. I received a few questions on my Instagram if this attraction was worth it or not. My answer is yes; one hundred times yes. 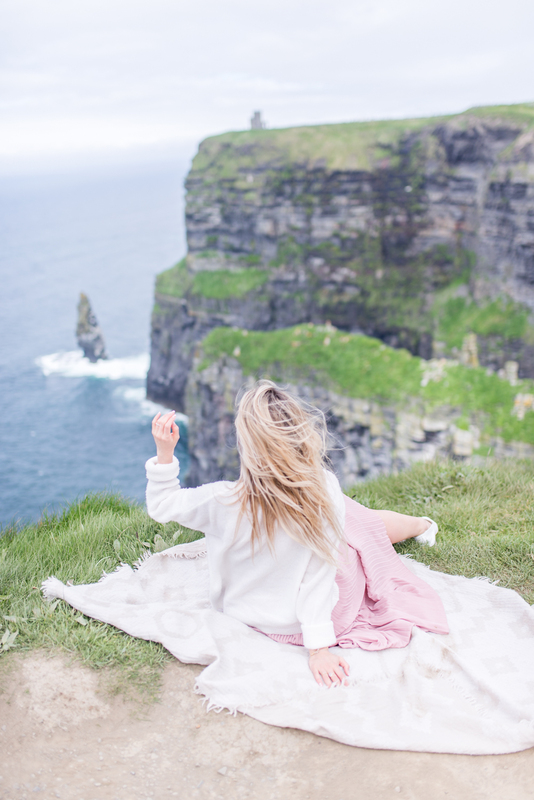 Even though the Cliffs of Moher are a huge tourist destination, you don't feel over crowded - you almost forget that anyone else is there! 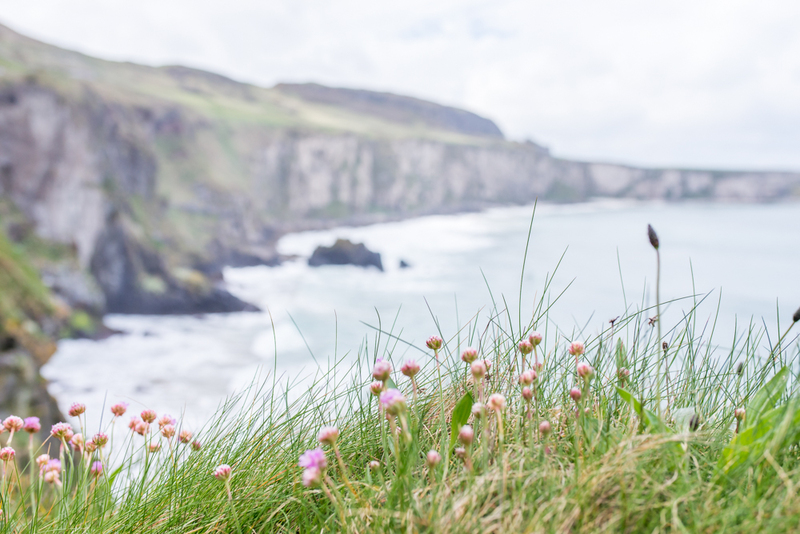 The beauty of the cliffs are hypnotizing, and you'll feel as though you're alone with just the smell of the sea and the sounds of the waves crashing. After a traditional Irish lunch at the Roadside Tavern, we continued to our hotel for the evening: the Glenlo Abbey Hotel. For me, this hotel are what dreams are made of, and it was my favourite property that we visited all trip. 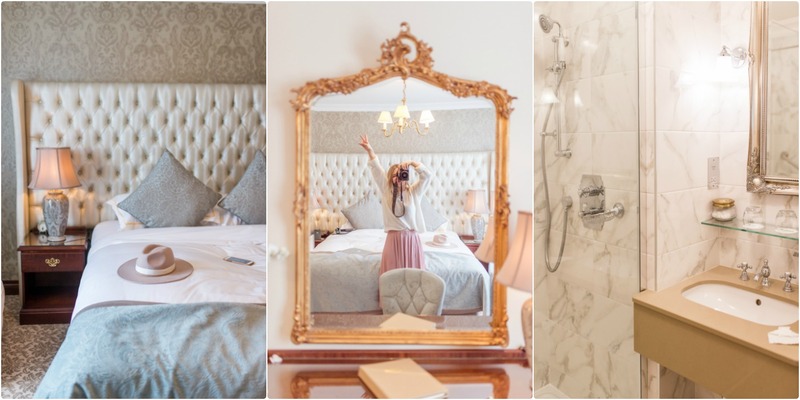 The opulence and beauty that this hotel had to offer were truly spectacular; it's set in an 18th century manor house! The grounds are also incredible and are actually an impressive golf course. I found the hospitality to truly be a cut above. 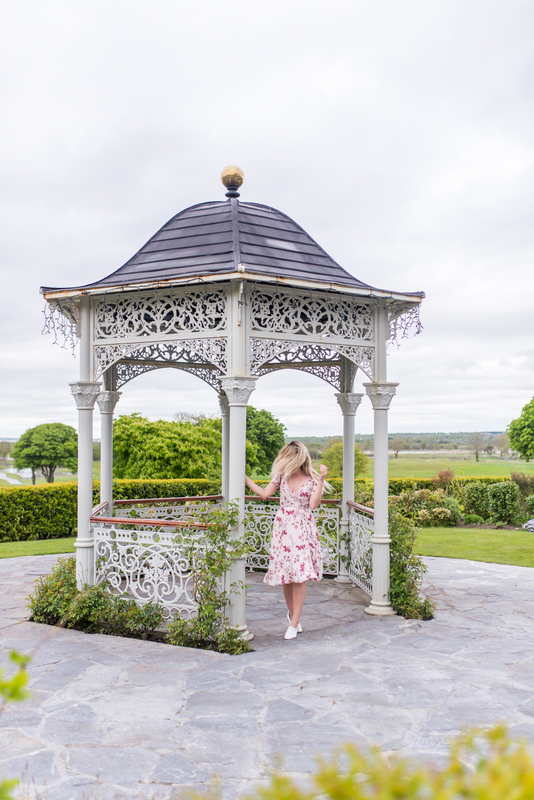 I felt as though I had stepped back in time at the Glenlo Abbey Hotel and will make it a point to go back when I find myself in Ireland next. For dinner, we were all so excited to be able to dine at the Pullman Restaurant at Glenlo Abby, right on the hotel grounds. It literally feels as though you step back in time to dine on The Orient Express - there's even two of the original Pullman carriages included in this gorgeous restoration. The dining experience is totally upscale, with white-gloved service and delicious food. I felt like the luckiest girl in the world after dinner, and went back to my beautiful hotel room to reflect on what I did to deserve such an incredible day. 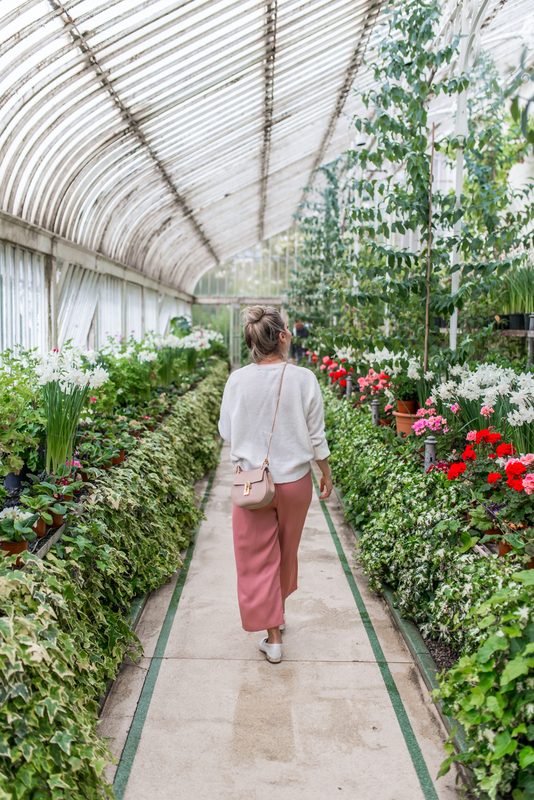 After a beautiful breakfast at the Glenlo Abby Hotel, we all packed our bags, hopped back on our trusty coach and headed back into the city to explore Dublin. Here's a bit of a funny story: we all had been asking our Vagabond coach driver Darren to stop in a field so that we could take photos with sheep. A super random and ridiculous request for sure, but we're bloggers - enough said! On our journey to Dublin, Darren actually found a field with some sheep for us to take photos on - he didn't forget! The scene was a hilarious combination of shrieks, outfit changes and cameras but I'll never forget it. It's little moments like this that make a trip, and this story in particular really shows how kind and accommodating the people of Ireland truly are. Once we arrived in Dublin, we dropped our bags at our home for the next couple of nights: The Alex Dublin. 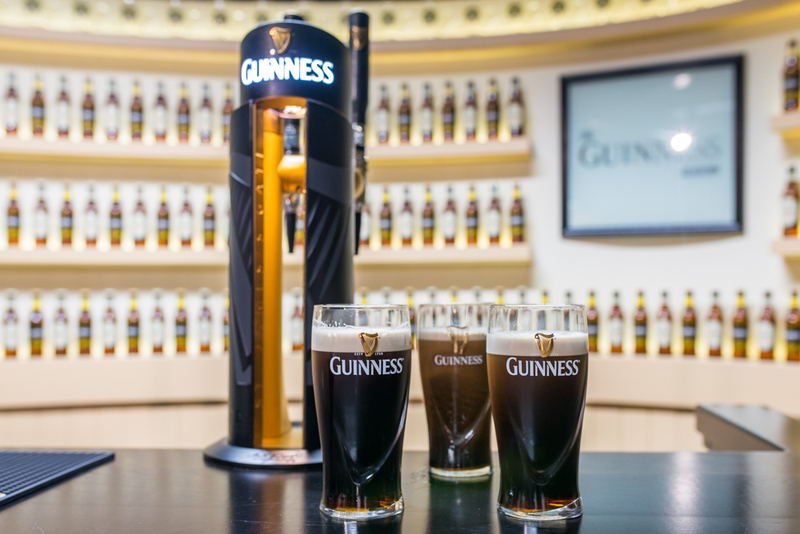 After a quick-change, we headed to our next destination: The Guinness Storehouse. Now, truth be told, I'm not a huge fan of Guinness - but I truly enjoyed learning the history behind the beer, and how tied into Irish history it is! 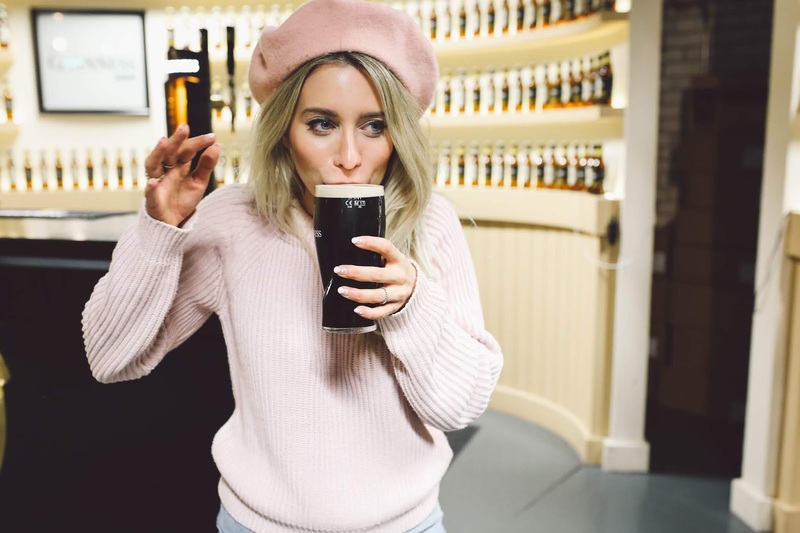 We also had the opportunity to learn how to properly pour our own pints of Guinness; it brought me back to my days as a bartender, and reminded me that I'm much better at being a blogger, haha! 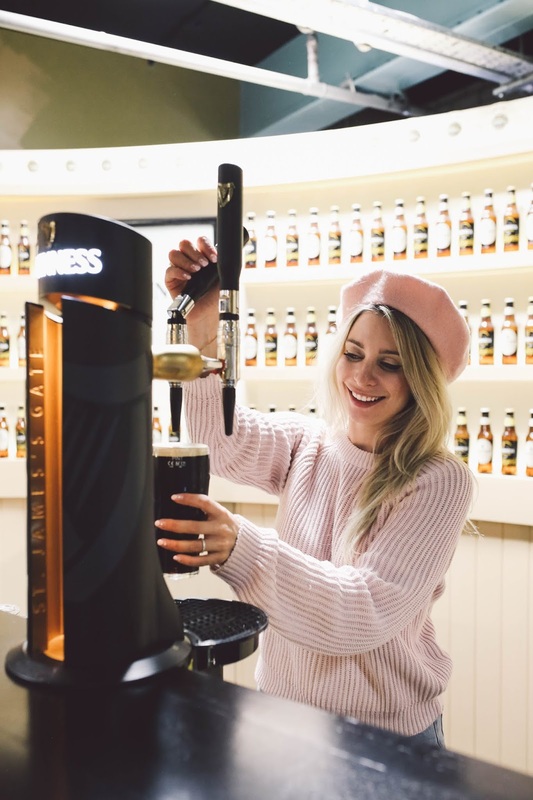 Even if you're not a Guinness fan, the Guinness Storehouse is a great, informative experience. We had some free time, so we decided to check out the local coffee culture that Dublin had to offer. 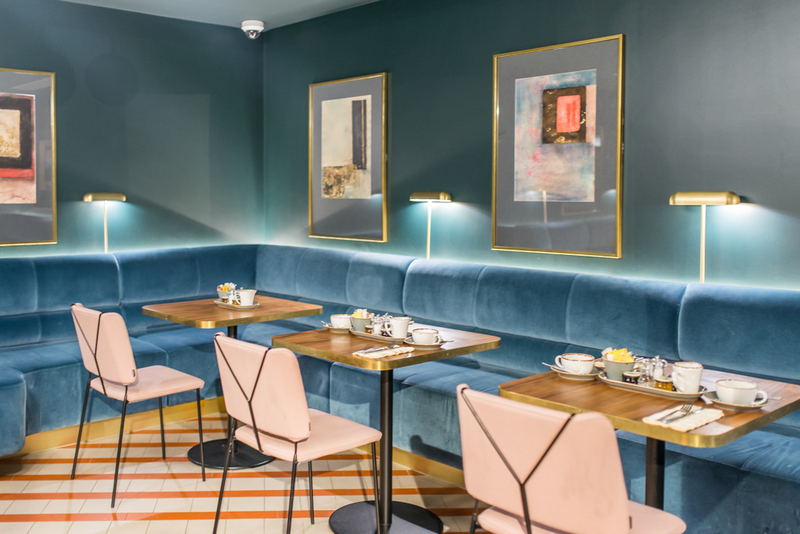 The coffee scene in Dublin is taking off, with cute little independent cafés opening up all around the city. 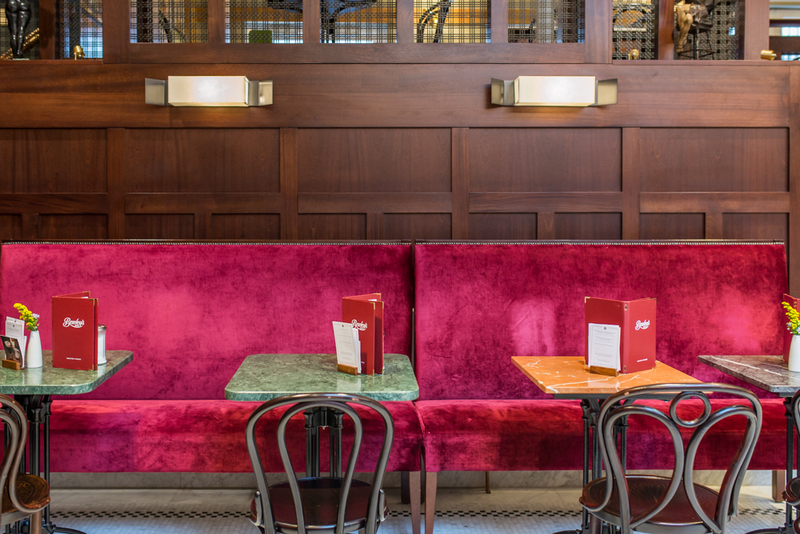 Our search took us to Love Supreme, a beautiful little café serving up strong espresso-based drinks in an aesthetically pleasing space - my kind of place! After a quick-change at the hotel, we headed out to our destination for the evening: dinner at L'Ecrivain. The meal was outstanding. 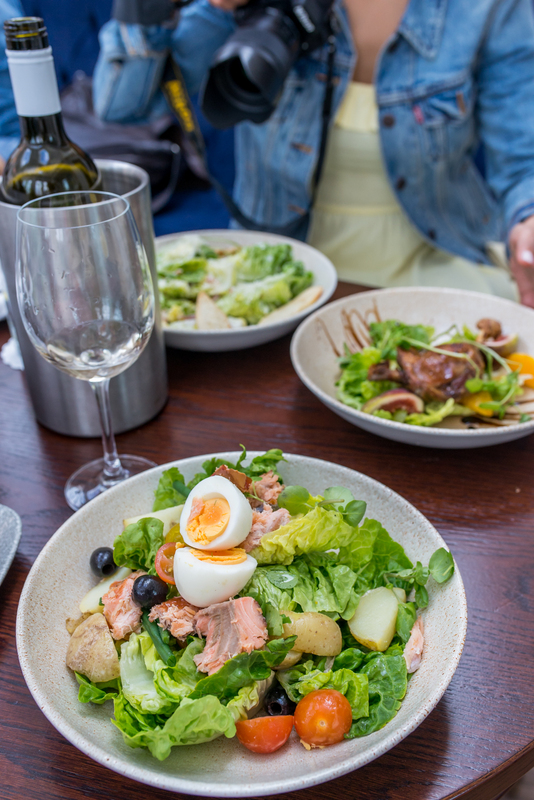 A french menu made with seasonal Irish ingredients. 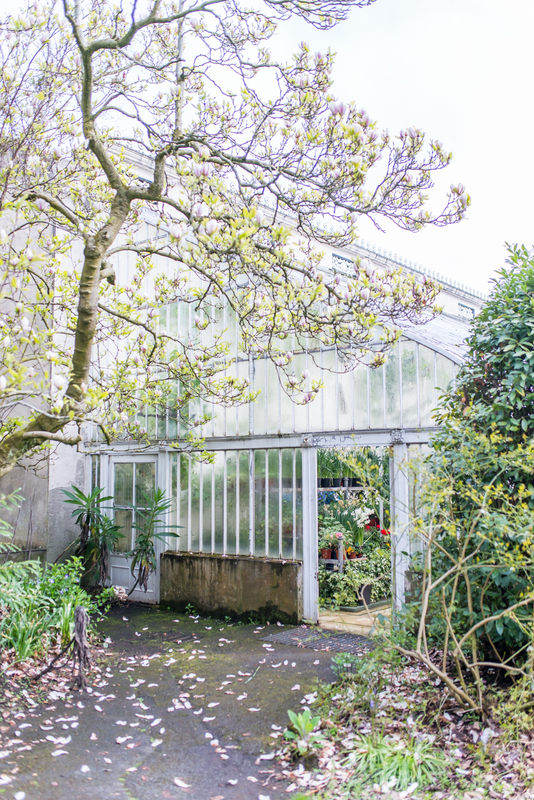 If you're looking for a treat-yourself meal in Dublin, I would highly recommend L'Ecrivain. After a delicious breakfast at our hotel, The Alex, we were all excited to spend the day exploring Dublin. Our day started with the Cool and Creative Dublin City Tour and the best tour guide, Orlaith Ross. 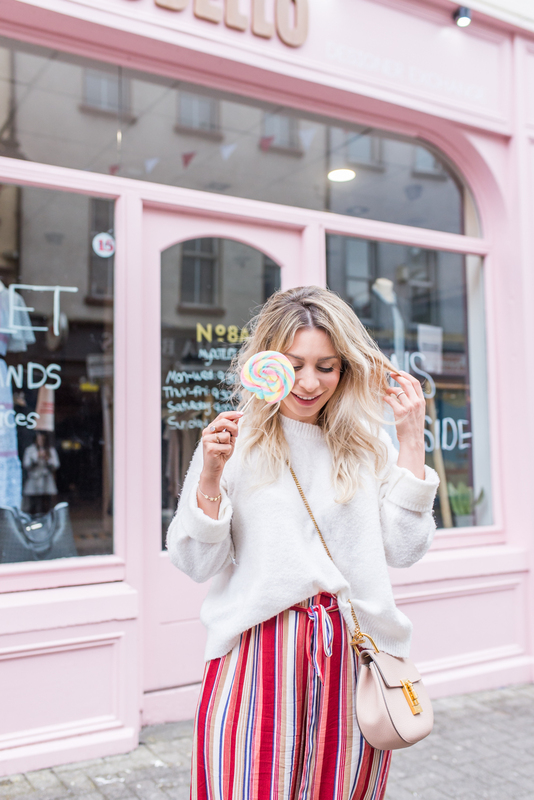 Orlaith knew that she had a group of bloggers on her hands that wanted to see all that was Instagrammable in Dublin, and while she provided us with all of the pretty places, she also took care to make sure that we were visiting places of substance. 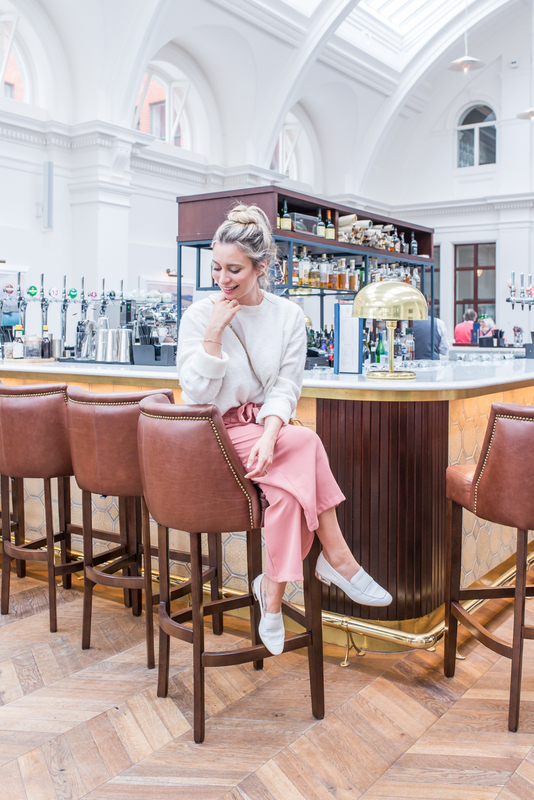 There were so many amazing spots that we hit, but two notable ones for me were Grafton Street Café (a.k.a. 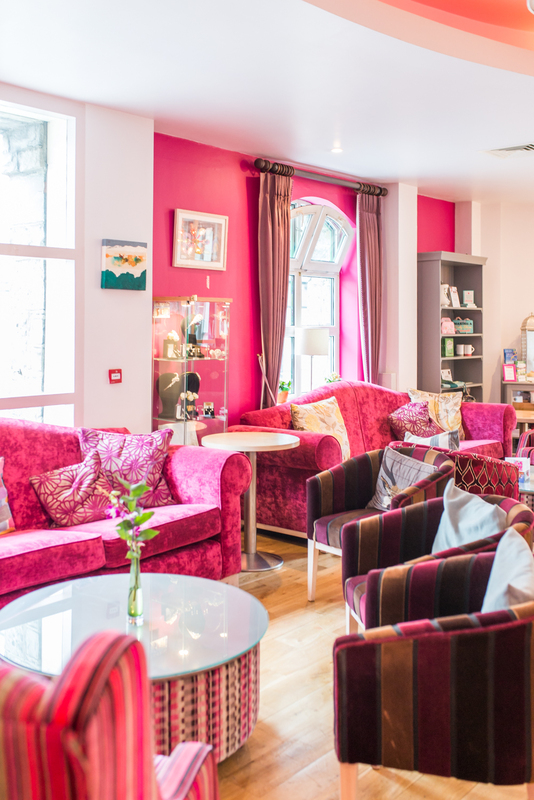 "Bewley's") on account of how celebrated it is in the community and Tropical Popical, a cute nail salon with fun wallpaper, amazing tunes and a place where women can meet to chat and just let loose. 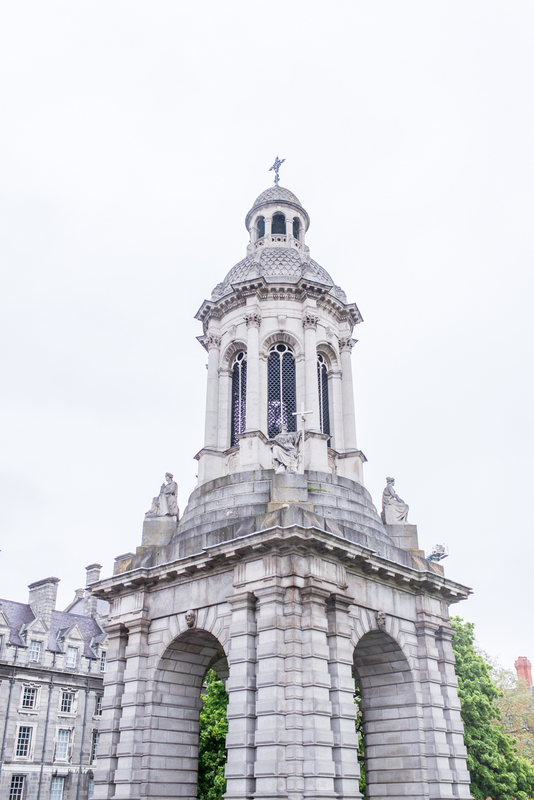 It became clear to me that Dublin is a city with a lot going on, and definitely warrants a few days to explore! 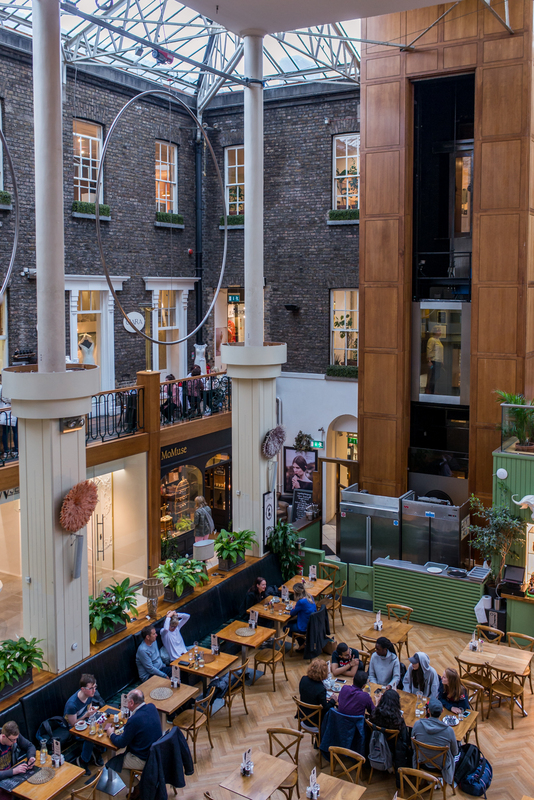 We had lunch at NoLIta's in the city centre, and then were left with some free time to explore Dublin. 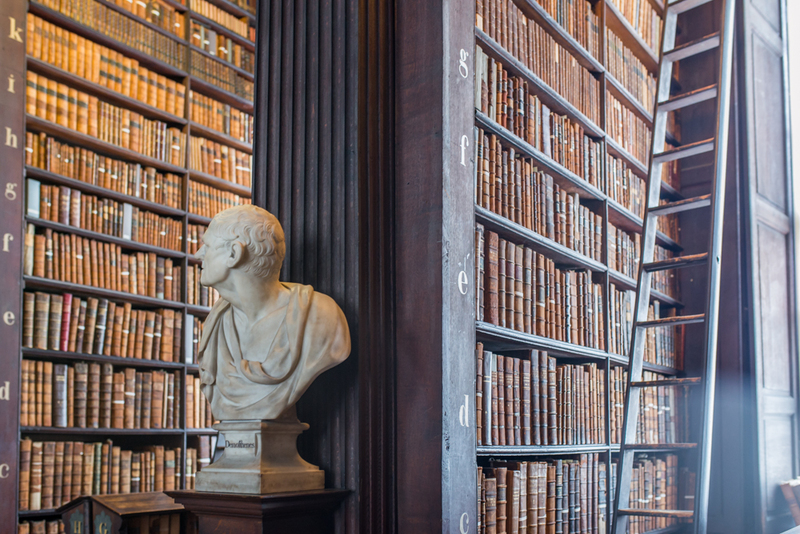 We all headed straight to the Book of Kells in the Old Library at Trinity College. What an incredible sight to see, and arguably one of the must beautiful libraries in the world. 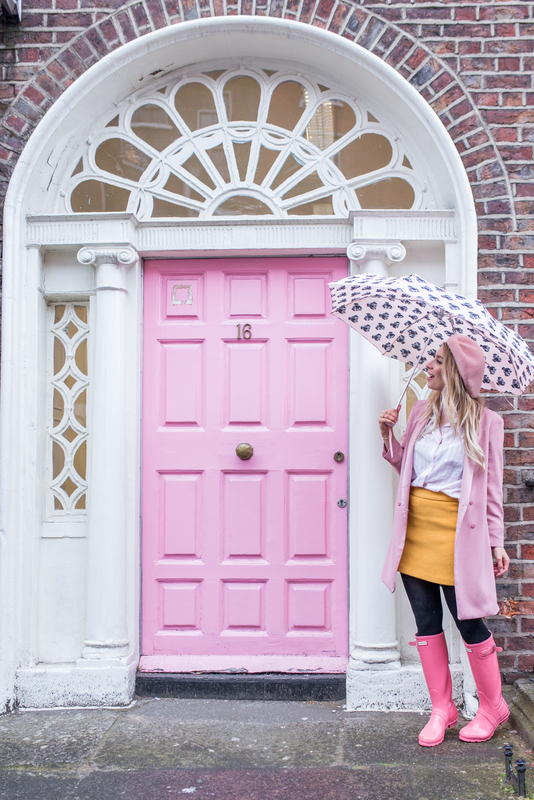 I then set off to find a pink door, since Dublin is famous for its colourful doors. 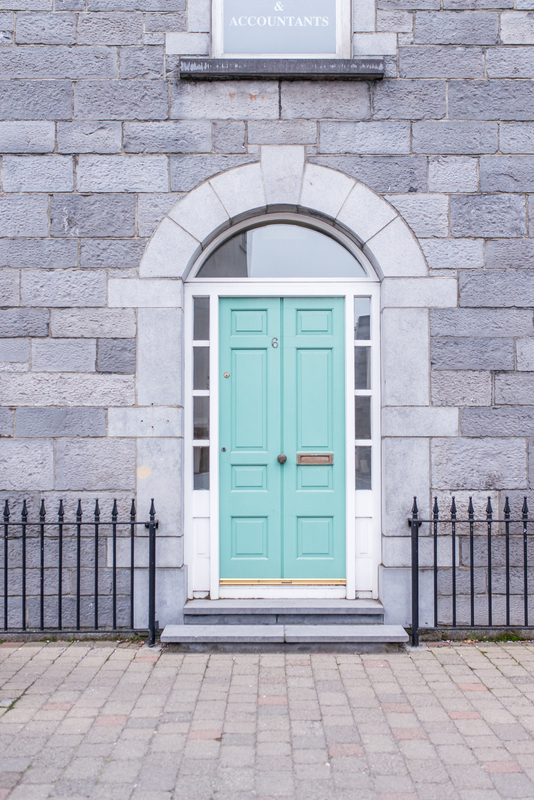 I had so much fun roaming around the streets of Dublin, admiring the colourful doors and was lucky enough to find exactly what I was looking for - a pink door with a white trim. The remainder of my free time was spent photographing said door, haha! Our last night in Dublin was by far my favourite of the trip. Although we were all sad to be leaving the next day, we decided to toast to a beautiful journey through Ireland in one of the most beautiful cocktail bars I've ever been to - Peruke & Periwig. If you find yourself in Dublin and are thirsty for a cocktail then I would definitely give this place a try. We all ended the evening singing and dancing to live Irish Music at Temple Bar. Fun was had by all, and before you knew it we were all laughing our way back to the hotel, to get ready to leave the next morning. 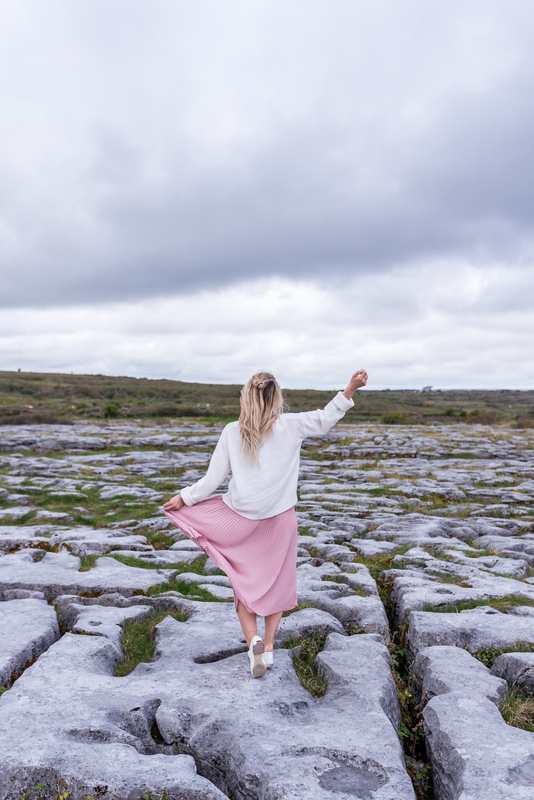 Our incredible seven night journey through Ireland with Air Transat came to an end, and I felt genuine sadness to leave. Ireland had totally exceeded all of my expectations; had humbled me in the face of natural beauty and would leave me with memories to last a lifetime. I had an incredible time, and hope to be back soon - especially while flying Air Transat. 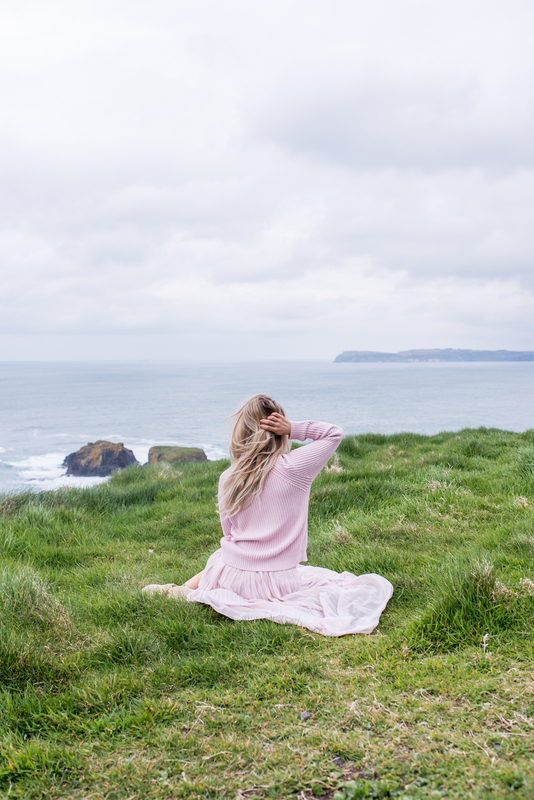 A very special shout-out to my traveling companions Lauren, Krystle, Isabelle and Filipa - I highly encourage you to check out all of their amazing blogs to see Ireland through their own unique lenses. Slán Ireland. Until we meet again. This post was sponsored by Air Transat. All thoughts and opinions are 100% my own. I loved this post! I can't wait to visit Ireland one day! Thank you so much for reading Melissa - it's a long one! I hope you visit Ireland, I already want to go back! HAHA yes! I also just randomly laugh about Pizzarella and the millions of other hilarious moments from this trip! Definitely memories I'll keep with me forever! Oh my, all those photos... I have always wanted to visit Ireland, esp. Dublin and countryside. Ahhh you have to go, Ireland is even more beautiful then they say! The photos just couldn't do it justice. Thank you for reading!